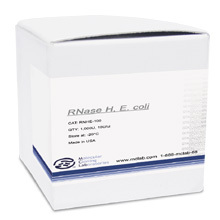 RNAse Inhibitor is an acidic, 52 kDa protein that is a potent, non-competitive inhibitor of pancreatic-type ribonucleases such as RNase A, RNase B, and RNase C. The enzyme is provided as a fusion of the porcine RNAse Inhibitor gene with a proprietary, 22.5 kDa protein tag. A recombinant E. coli strain carrying the porcine RNAse Inhibitor gene. 1. Blackburn, P., 1979. Ribonulcease Inhibitor from Human Placenta: Rapid Purification and Assay. The Journal of Biological Chemistry, Vol. 254, No. 24 pp 12484-12487. Figure 1. RNase Inhibitor Activity test by SpectraMax M5 system. 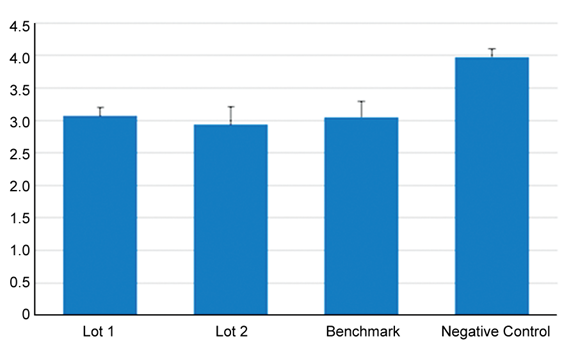 Comparing to benchmark’s and paralleled negative control, results show MCLAB’s RNAse Inhibitor are functionally equivalent with benchmark’s product. Figure 2. RNAse Inhibitor functional test. 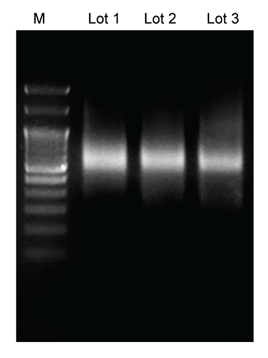 Gel electrophoresis after RT-PCR shows MCLAB’s RNAse Inhibitor is functionally equivalent with benchmark’s product.